Plant estolide-based hydraulic fluid could replace conventional fluid in a wide range of industrial and farm equipment. 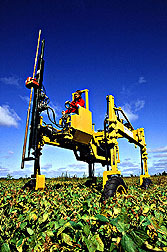 Here, a specialized machine built for soil sampling uses hydraulics to raise or lower its height, adjust its width, and drive the wheels. A commercial-grade, biodegradable hydraulic fluid to power heavy equipment is just around the corner, thanks to a new process that creates a key component from vegetable oil. Agricultural Research Service scientists at the National Center for Agricultural Utilization Research in Peoria, Illinois, have made hydraulic fluid that contains estolides from oilseeds such as meadowfoam and high-oleic soybean oil. A class of long-chain esters, estolides are the basic ingredient in many hydraulic fluids. These fluids, under pressure, transmit power to moving parts of many machines, including cars, bulldozers, tractors, and most heavy equipment used to build roads and structures. The scientists began by making a plant-based estolide from meadowfoam seed, an oilseed crop Agricultural Research Service, discovered why. researchers helped breed and develop uses for. Grown primarily in the Northwest, meadowfoam is an ingredient in cosmetics and other facial-care products. "We found that it also showed promise as a basestock in hydraulic fluid," says Terry A. Isbell, an ARS chemist who helped develop meadowfoam. But poor low-temperature properties and cost were prohibitive. However, "We used the technology developed for meadowfoam estolides to make estolides from other vegetable oils," Isbell says. "We found that oils that are particularly high in oleic acid, such as sunflower, safflower, and some soybean, would serve as a good source of starting material for the formation of estolides." Petroleum-based hydraulic fluids and lubricant basestocks do not degrade well. Recently, construction equipment manufacturers began seeking a biodegradable alternative, in response to tighter environmental regulations. In tests, about 30 percent of a petroleum-based hydraulic fluid degraded in 28 days, compared to 80 percent for vegetable-based estolides. The scientists' challenge: making estolides in large enough quantities to be economically feasible for commercial manufacturers like Caterpillar, a heavy equipment manufacturer with headquarters in Peoria. Caterpillar is testing the new biodegradable hydraulic fluid in cooperation with ARS and Lambent Technologies of Chicago, Illinois. "The initial yield of estolides in our tests with vegetable oil was very small because our process wasn't very efficient," says Isbell. "Estolides have been made for a long time but never in large enough quantities to be practical on a commercial scale." Serendipity helped overcome this problem. "One day, Beth Stiner, a lab technician formerly with ARS, conducted an experiment mixing vegetable oils with sulfuric acid. The result was a very high yield of estolides. We've adapted that reaction for our work," says Isbell. Researchers made estolides by breaking vegetable oils into their two main components: fatty acids and glycerin. In doing this, they discovered that sulfuric acid acted as a catalyst to form the estolides. Estolides form when two fatty acids the building blocks of vegetable oils link together. ARS researchers used a blend of fatty acids that could be obtained from high-oleic oils. Oleic acid is commonly used in formulating food products that seem to show potential for lowering blood cholesterol in humans. It also displays chemical properties scientists want in formulating biodegradable hydraulic fluids. A provisional patent has been filed on this new product. Lambent Technologies, formerly Calgene, is seeking licensing rights to market the product commercially. "Right now we're waiting for Caterpillar to test the product and give us their feedback," says Isbell. By Dawn Lyons-Johnson, Agricultural Research Service Information Staff. Terry A. Isbell, USDA-ARS New Crops Research Unit, National Center for Agricultural Utilization Research, 1815 N. University St., Peoria, IL 61604; phone (309) 681-6235, fax (309) 681-6524. "Biodegradable Plant-Based Hydraulic Fluid" was published in the November 1998 issue of Agricultural Research magazine. Click here to see this issue's table of contents.